It was the 1930s, the era of the Great Depression, a time when America was facing hopelessness and desperation as the prospects of war slowly grew to a boiling point over in Europe. And, amidst all that, the automatic transmission was born. First brought to market by General Motors and popularized by the Hydra-Matic and its successors, automatic transmissions differed from their manual counterparts through the addition of a self-sufficient hydraulic fluid-based automatic shifting system, allowing cars to shift gears without driver input, versus the classic manual or stick shift system. Ever since automatic transmissions hit the market, the same debate has been raging on for decades: which drives better? Which goes faster? 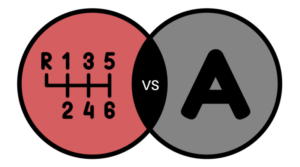 Which transmission type, between the automatic and the manual, is the superior one? Before we go into what the answer is and why, let’s delve a little deeper into the debate. Car transmissions are pretty complicated when you get down to the molecular level, but superficially, it’s simple stuff. Fuel and air go into the engine, things go boom, and the energy generated by the combustion travels through the input shaft into a metal case filled with differently-sized gears. The torque from the input shaft is translated into power through the gears that the transmission currently has engaged, out through the output shaft and into the rest of the car, depending on how it’s built. The manual transmission came first, and its history goes back to the days of the very first real gearbox. The concept is simple, even though the application may have changed throughout the years: a shift lever attached to the transmission lets you shift from one gear/speed to another, but only after the clutch, which can be found between the transmission and the engine, is released. The clutch holds the current gear in place – to shift with a stick, you have to disengage the clutch by pushing down on a pedal next to the brake, then reengage the clutch by letting go. Driving stick is a matter of several things, including knowing when to shift to which gear, and timing your clutch to prevent too much wear-and-tear. Engaging the clutch too slowly will wear the disc out – on the other hand, engage the clutch too quickly while stationary, and the engine might stall. In the other corner, we have the automatic transmission. GM and Ford first came out with these – transmissions that were built largely like manual transmissions, except that they allow for an automatic shift in gears without any input from the driver, through a monitoring system which takes into account the car’s speed, engine rpm and throttle pedal. In the past, this was done hydraulically – today, it’s all electronics. Most automatic transmissions come with a little computer in them. You can still pick up an old 7004R or any other among a series of powerful non-electronic automatic transmissions, and refurbish them for modern use – but the concept is the same. An automatic transmission comes with a host of convenient quality-of-life benefits, including less maintenance (generally speaking) and improved, smoother driving in stop-and-go traffic. It’s easier to drive an automatic as well, given that you don’t have to worry about the clutch at all, and you don’t have to run the risk of stalling the engine. Under heavier engine load, however, automatic transmissions can get a little sluggish – and if mismatched or left non-optimized, plenty automatic transmissions forego the whole “smooth” driving experience. Manual transmissions involve the use of a clutch and a shift lever to switch gears, and you can’t rely on the car to do it for you. Automatic transmissions use a series of electronic sensors and hydraulic fluid to shift gears automatically. In the past, manual transmissions were the better answer for sheer performance and fuel efficiency – the ability to determine when to shift gears gave manual transmission drivers the upper hand on fuel, and a manual transmission handled well accelerated faster. Today, technology has basically caught up with the stick shift, and there’s little reason to go manual if your intent is to leave the other driver in the wind. Automatic transmissions come in various types, but they’re winning in almost every single department: there are more automatic transmissions out there than manual transmissions, and the newest models are just as fuel efficient and accelerate just as well. The race between the automatic and manual transmission is wholly based on the year it takes place in. If we take the world’s fastest cars, one from each camp, then the automatic transmission is the flat-out winner. Sure, it’s still definitely more expensive to grab a complex CVT, but in some cases, you can find cars that cost more with a manual transmission than with an automatic. However, manual transmissions are still fun to drive – and if you’re limiting your options to older transmissions, then a competent driver behind the wheel of a stick shift can still pull ahead in a race. That being said, there is still one thing the manual has over the automatic: coordination and skill. Driving stick is still a skill, and a good skill to have. And if you’re sick of the clutch, just grab an automatic manual transmission.